The Travel Berkey is the smallest and most compact of the Berkey water filter systems. The Travel Berkey is suitable for use during travel, such as camping in the Lake District or on a secluded beach in Cornwall, in a caravan touring the Scottish highlands, or during unexpected emergencies whether out in the English countryside or in the middle of London. The Travel Berkey is the perfect water filter system for a single person household or a kitchen without much counter space. The Travel Berkey water filter system may be ordered with your choice of one discounted Berkey accessory. For a description of the various Berkey accessories see: Sightglass Spigot, PF-2 Fluoride/Arsenic Filters, Stainless Steel Spigot, Berkey Replacement Parts, Berkey Stand or Berkey Primer. The Travel Berkey water filter will purify your home’s treated tap water as well as untreated water from such sources as lakes, brooks, ponds and water sources in foreign countries, where the local water supply may be compromised or regulations may not be adhered to. 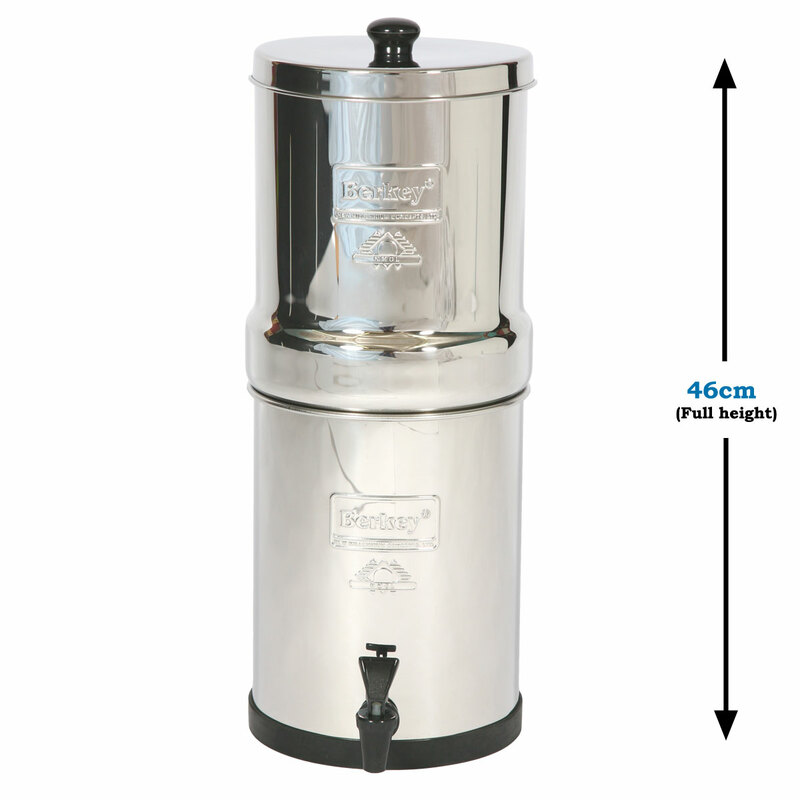 The Travel Berkey is the ideal water filter for all outside activities and is definitely a must in inhospitable environments where electricity or clean drinking water may not be at hand. The Travel Berkey assembles in minutes with no need for tools, electricity, water pressure, or plumbing. 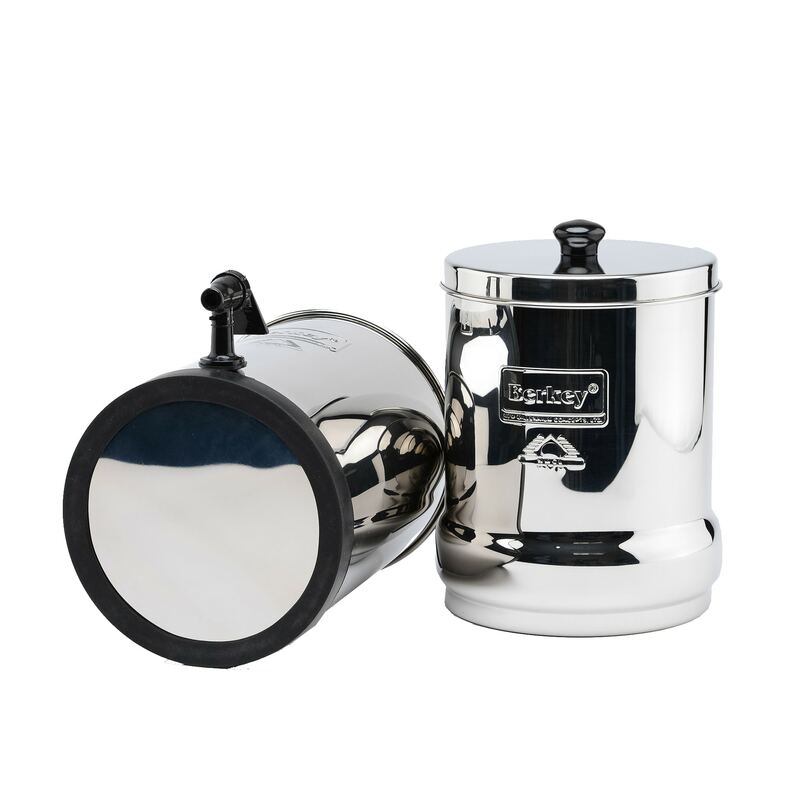 The Travel Berkey is also easy to operate, clean, and maintain. The Travel Berkey water filter system eliminates pathogenic bacteria, cysts and parasites entirely as well as removing toxic chemicals such as herbicides, pesticides, pharmaceuticals and all manner of VOCs, organic solvents and trihalomethanes. In independent testing the Black Berkey filters have also been found to reduce nitrites and toxic minerals among others: lead, mercury and aluminum (See a detailed list of which contaminants are eliminated by the Black Berkey Filters). 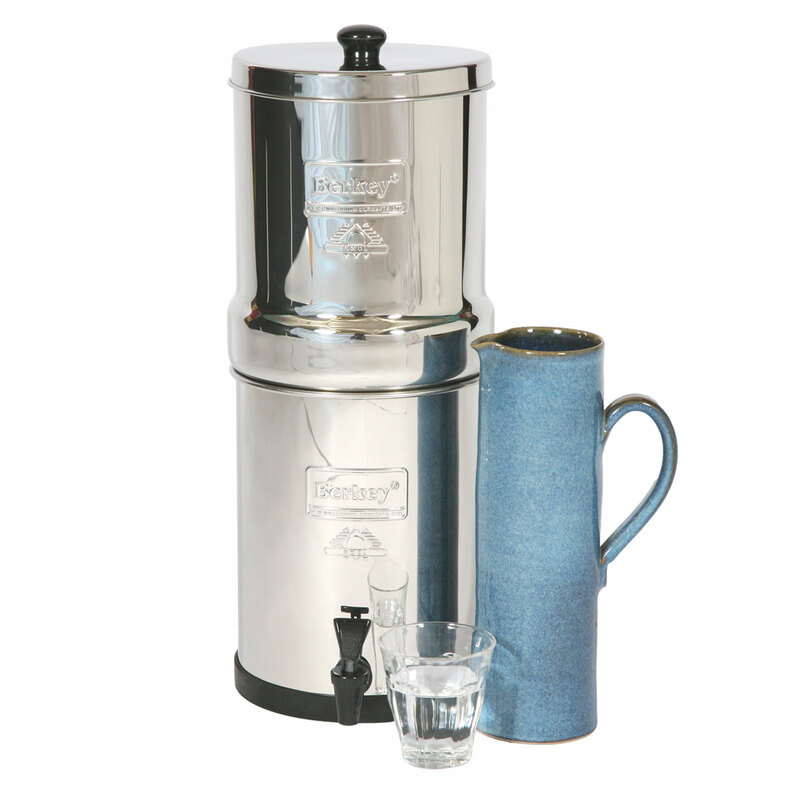 Besides this the Travel Berkey water filter leaves undisturbed and intact the beneficial minerals your body requires. The Travel Berkey is manufactured from highly polished 304 stainless steel and the water filter system comes standard with two Black Berkey filters. The upper chamber can be fit within the lower chamber and measures only 12 in. (30.5 cm.) in height for easy transport. What TDS meter ppm reading will water filtered through the Travel Berkey system achieve? A TDS meter measures only Total Dissolved Solids or minerals; dissolved solids are simply dissolved minerals in an ionic form. A TDS meter does not measure the amount of biological and chemical contaminates, it tells you nothing about the quality of your drinking water. 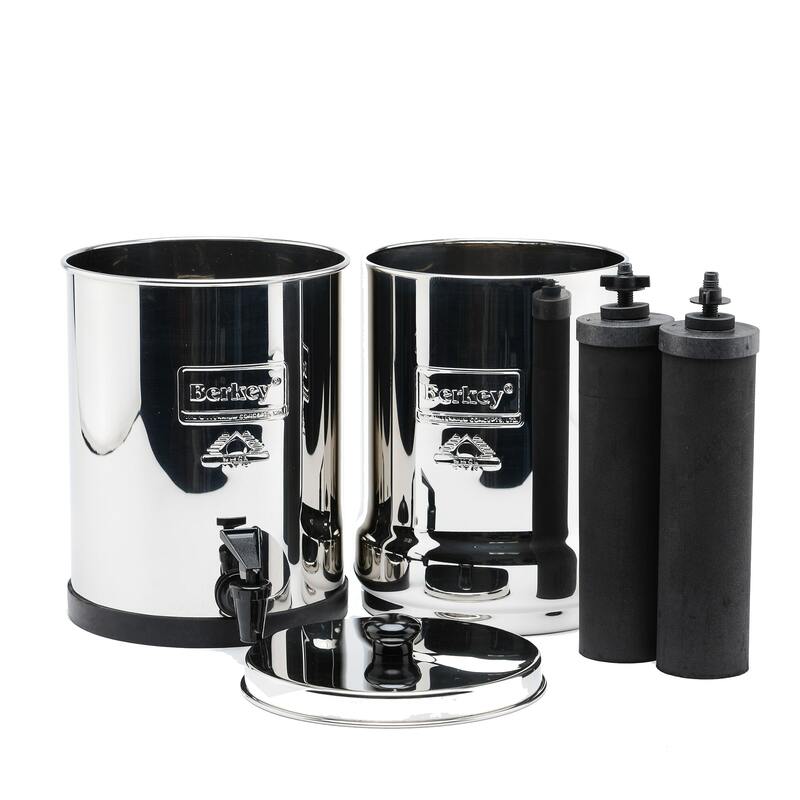 Black Berkey filters are designed to leave the healthful and beneficial minerals in your water and to extract only the unwanted heavy metals such as lead and mercury as well as sedimentary minerals such as iron oxide and aluminum. The TDS reading will be the same after filtration through the Black Berkey filters as the minerals are not removed. I am interested in your filters I live in Italy where we have a very high calcium content in the water. Will the filter take some away and or will the calcium carbonate ruin the filter? No, the Black Berkey filters will not remove the calcium from your water. The Black Berkey filters are designed to leave the beneficial minerals in your water and only remove the harmful contaminants. The hardness of your water will not ruin the filter, in some very rare cases the filter may need to be shaved after a while due to a buildup of minerals on the filter this is easy to do and resolves any problems. As I said this is quite rare and happens in less than 1% of the cases of people with very hard water. I live in a very hard water area myself and have no problems with my filters. Does the price include the Black Berkey Purification Elements? Where is it shipped from? Yes, all prices for the Berkey systems include a set of Black Berkey filters. Everything is shipped from the UK, free delivery to anywhere in the UK or EU and there are no extra costs.